Fewer than one in thirty (3%) organisations are currently, what we would term, ‘Play-Makers’ – those that have embedded employee engagement practice, both strategically and tactically, to the extent of effectively sustaining and/or optimising employee engagement. Employee engagement as a term has generated huge interest and comment across the globe and continues to do so. But just how far have organisations got in terms of embedding leadership and management practice that enables employee engagement in improving/sustaining productivity and performance? Only three in ten (28%) organisations reported that employee engagement was understood across managers and employees. Just one in five organisations (19%) has some form of development programme explicitly providing learning relating to employee engagement. Around two in five (43%) organisations do not currently provide structured learning on employee engagement, reinforcing why its understanding in organisations is not consistent or wide-spread. Just under half of organisations (47%) conduct surveys on an annual or more than annual basis (i.e. quarterly or six-monthly). There is considerable diversity in the number of questions asked in employee surveys though three quarters of organisations (74%) use greater than 20 questions. One in two organisations (49%) links their employee survey data with other people data, whilst a similar number (44%) links their employee survey data to other organisation performance data. Three in five (61%) organisations benchmark their employee engagement both internally and externally. One in six (16%) organisations use what can be described as an ‘integrated approach’ utilising the various enablers (‘infrastructure’) in a joined-up fashion. One in four (26%) organisations provide development to all managers and continue with ongoing programmes. The rest provide development/training but to lesser, varying degrees. Only three in ten (28%) organisations utilise an employee engagement playbook to codify approaches and understanding, either fully or in part. In conclusion, ‘Employee engagement’ in its application appears to have taken a meaning that is ‘all things to all people’ with the result that it risks becoming an abstract or indeterminate phrase to use professionally. Our survey findings suggest that ‘employee engagement’ in many cases lacks this robustness, potentially undermining the good efforts in measurement, enhancement and education that some organisations undertake. In line with this, the market study shows that some organisations survey their employees with measurement approaches that are limited or lack sufficient question depth for insight. 1. Efforts to link ‘employee engagement’ to organisation people/performance data will be undermined and most likely fail to meet expectations – potentially dampening organisational interest in what should be seen as a core component of organisation measurement. Similarly, external benchmarking without consistency of core concept becomes a relatively futile exercise. 3. Attempts to widen the understanding of employee engagement, a key change aspect itself, across the organisation will similarly be undermined and attempts to successfully embed employee engagement practice will inevitably become mired in confusion with any impact significantly reduced. 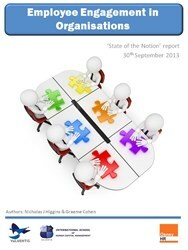 The complete report, Employee Engagement in Organisations: State of the Notion report, is available at http://www.valuentis.com/Homepage.html . An alternative web view version is also available at http://www.slideshare.net/njhceo01/valuentis-employee-engagement-in-organisations-report-300913-abridged-web-view.